You can use a whole cut up chicken, feeds many and can be done the day before! Mix flour and salt and pepper, coating chicken pieces with it. Heat oil, on high, in large skillet. Brown chicken a few pieces at a time, drain each and pour off leftover fat. On low heat butter adding the flour stirring constantly 2 - 3 minutes. Add a little broth, stirring, adding the rest when lump free. Add cream and wine/broth, returning chicken to the pan adding mushrooms. Cover and cook over medium heat 30 - 40 minutes, until tender. Remove from heat and let cool. Refrigerate overnight or at the least, 5 hours before serving. Remove from refrigerator and bring to room temperature before reheating in oven, 325 - 350 degree F oven for 15 - 20 minutes until heated through. 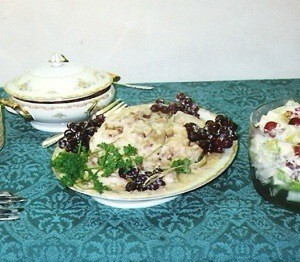 Picture is of my Grandmothers good silver and china, the Chicken Cecile and a fruit salad.